A new report by the World Bank, “Global Findex Database 2014: Measuring Financial Inclusion Around the World”, has said that the Government of India’s high-profile Jan Dhan scheme, launched for bank transfer subsidies to the poorer sections of India’s population, has been lacking any “explicit purpose”, one reason why around 43 per cent of the country’s accounts are "dormant." The report, which has been authored by Asli Demirguc-Kunt, Leora Klapper, Dorothe Singer and Peter Van Oudheusden, has found that the account penetration in India of all adults is 53 per cent, of women 43 per cent, and of adults in poorest 40 per cent households is 44 per cent. 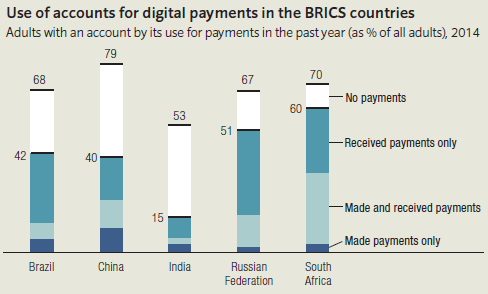 While this may be some consolation as it is much better than the neighbouring Pakistan (13 per cent, 5 per cent, and 11 per cent respectively), it is worse than not only all other BRICS countries but also the average of the developing countries. Thus, in China the account penetration among adults is 79 per cent, women 76 per cent, and among adults in poorest 40 per cent households 72 per cent. The respective figures for Brazil are 68 per cent, 65 per cent and 58 per cent; for Russia 67 per cent, 70 per cent, and 62 per cent; and South Africa 70 per cent, 70 per cent, and 58 per cent. The developing countries’ average is 54 per cent, 50 per cent, and 46 per cent, and world average is 62 per cent, 58 per cent, and 54 per cent. 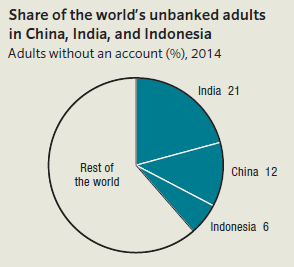 In South Asia about 40 percent have an account classified as dormant. One possible reason for this is the large number of accounts opened within the past year in India, many of which were set up without an explicit purpose in mind.